Mountain Spirit Institute’s newest board member Ken Wylie has been expressing the vital requirement of vulnerability in which to build a foundation of compassion and connection (which is our mission) to the natural world, each other and a deeper connection to ourselves. It appears that like great minds think alike – Brené Brown states in her TED talk: The power of vulnerability. Brown studies human connection – our ability to empathize, belong, love. In a poignant, funny talk at TED in Houston, she shares a deep insight from her research, one that sent her on a personal quest to know herself as well as to understand humanity. See Brene’s talk here or click on the image at right. Special thanks to Lindy Roberts in Auckland, NZ for sending this our way. Old Hawaiian system of communication and engaging with the universe that actually works to make a better world. I’ve been meaning to write about this book for a while, and a recent email prompted me to follow through. On one hand, while the cover, and some of the book’s precepts are a bit hokey, such as getting the woman and car you want, I doubt I’d be married to the wonderful woman that’s my wife, had I not actively engaged the universe and actually asked for what I want. I was using this technique during the summer just before we met. I was leading a mountaineering course in Alaska at the time, and while in the mountains, practiced the technique about 30 times per day. This book illustrates a technique that has quite a track record and impressive story behind it. Below is an email from a good friend to whom I recommended the book and technique. As Tolle says, “Are you polluting the world or cleaning up the mess?” This technique helps you do your part to clean up the mess. I really enjoyed our conversation today. 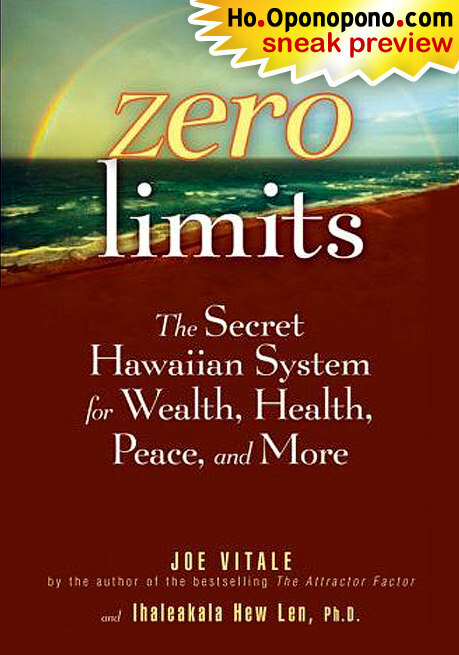 Shortly after our conversation, I Googled some reviews of “Zero Limits” as well as several pages of the book itself in the form of a preview. In it are perhaps the most potentially life changing ideas I have ever encountered. I thank you very much for introducing it to me. I am going to order copies for several friends and myself. Yes, this technique of simply saying “I love you, I’m sorry, Please forgive me, Thank you”, is still working wonders in my life. It’s time to raise the bar for all of us, isn’t it. Thanks for the link to Meninger. I’ll check it out. “To be capable of steady friendship or lasting love, are the two greatest proofs, not only of goodness of heart, but of strength of mind.